Family means everything to DREAMer Zury Gonzalez-Amaro. She came to the U.S from Oaxaca, Mexico with her mother and siblings in 1993, when she was 10 years old. 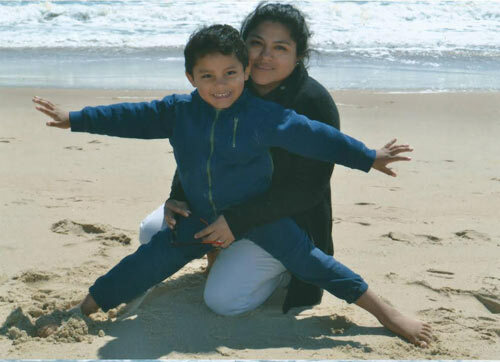 They made the journey to reunite with her father, who was already living in New Jersey. “When I was in high school, I had good grades,” she says. Because she was such a good student, her teachers encouraged her to apply for scholarships. But she already knew the outcome: “I was not going to get it because they want a social [security number].” However, with her enrollment paperwork from high school, she was able get a job at CVS during her senior year. She ended up staying there for the next eight years and then left in 2010 to focus on starting her own family. Zury, now 32, is devoted to her husband and their 4-year-old son, who has become the priority, mainly due to health issues from his birth. “I had a very rough pregnancy with my son,” she says. He had been continuously sick ever since, in and out of the hospital. However, during a conversation one day with her sister and brother-in-law, they asked what she wanted to do regarding her education. She told them, “I don’t know – I’m worried about my son – and I don’t know if I would have the money to pay for my school.” Her sister responded, “well, why don’t you apply for TheDream.US scholarship? It’s a scholarship for DREAMers.” Zury went home that night and researched all about it; committing herself to finally earning a degree. Now, a TheDream.US scholar, she works diligently towards an Associate’s Degree in Business Administration at Mount Washington College online – a choice she made to have the flexibility to still be there for her son. However, the challenges are plenty. She explains: “[my classes] are from 11:00 to 3:30 [pm-am] three to four times a week. Sometimes I get so tired and I think I need to go to sleep now because it’s late, but when I go to bed, my mind is still running — I guess that’s the hardest thing. Waking up in the morning is another thing, because I have to be up when my son gets up.” Thus, time management has become an important skill for Zury. “If he’s playing with his toys in the living room, I could do a little bit of schoolwork during the day,” she says.